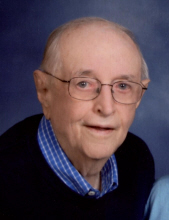 James "Jim" D. McKay, 94, of Greenville, PA, passed away at 10:00 pm on Sunday, February 3, 2019 at St. Paul's in Greenville. He was born in Jackson Center, PA on March 4, 1924 to the late Daisy McKay. He was adopted at the age of 9 and raised by his grandparents, Daniel and Elizabeth (Amos) McKay. Jim was a member of Holy Trinity Lutheran Church in Greenville. He was a former member of the Greenville Area Chamber of Commerce, former vice president and board member of the former Greenville Country Club, member of the Vineyards Country Club in Naples, Fl, member of the marketing committee of the Aluminum Association, member of the marketing committee of the Aluminum Extruder's Council. Jim also served in the United States Navy during WWII. He was a 1941 Mercer High School graduate. Jim attended the University of Louisville and the University of Michigan while he was in the Navy and received a Bachelor of Engineering degree from Youngstown State University. He retired after 42 years of service from R. D. Werner Co., Sugar Grove Twp., where he was chief estimator, sales manager of mill products, and vice present of mill products sales. Jim was an avid golfer and bridge player, attaining the Bronze Life Masters Status. He was a wonderful storyteller, and his grandchildren lovingly referred to him as "Poppy." Jim touched many lives, leaving a lasting legacy of friendship and memories. He positively affected all who were lucky enough to know him. James is survived by his wife at home, Karen D. (Kerr) McKay. They were married on July 11, 1987. Also surviving are: four sons, Bruce J. McKay of Naples, FL, Rev. David G. McKay, and his wife, Peggy, of Indianapolis, IN, Richard C. Peters of Greenville, PA, and Douglas A. Peters, and his wife, Sharon, of Meadville, PA; two daughters, Jane F. McCall, and her husband, Mark, of Greenville, PA, and Anne F. Cannarozzi of Springfield, OH; 15 grandchildren; and 27 great grandchildren. He was preceded in death by: his mother, Daisy McKay, grandfather, Daniel McKay, grandmother, Elizabeth McKay, three sisters, Marjorie McConnel, Joann Ringer, and Alyce Skinner, and former wife, Marie G. (Livermore) McKay. A memorial service with committal prayers will be held at Holy Trinity Lutheran Church, Penn Ave. & Clinton St., Greenville, at 11:00 am on Thursday, February 7, 2019, with Rev. Brenda Martin of the church, officiating. One hour of visitation will be held prior to the service in the Roth Library from 10:00 am - 11:00 am at the church. A private urn burial will be held at Shenango Valley Cemetery, Greenville, PA, at a later date. Memorial contributions can be made to: Holy Trinity Lutheran Church, 1 Trinity Place, Greenville, PA. 16125. Messages of sympathy, stories, and photos can be shared at: www.osborne-williams.com. To send flowers or a remembrance gift to the family of James "Jim" D. McKay, please visit our Tribute Store. "Email Address" would like to share the life celebration of James "Jim" D. McKay. Click on the "link" to go to share a favorite memory or leave a condolence message for the family.